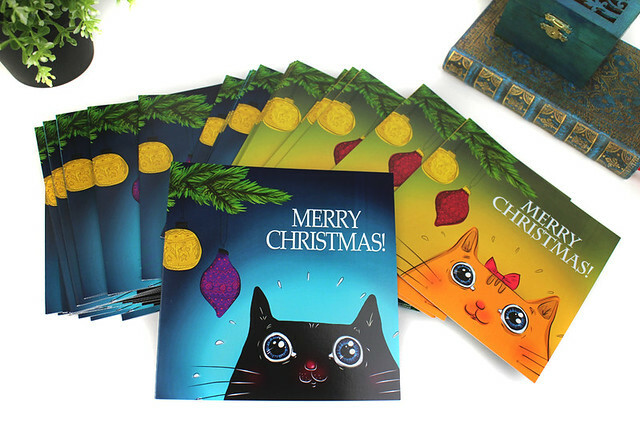 ​When I designed the 'Cat versus Christmas' card, I wanted to feature an orange cat. I've got a black one at home, so don't ask why. But later on I thought it would be cool if people could personalise these cards. And this is what Louise did! She asked for a black cat instead (no ribbon) and a turquoise+purple scheme to go with her personality. And this is how this pretty card was born! To be honest, this version is way cooler! If you also enjoy my Cat Christmas card with a twist, then you can buy it from my Etsy shop.